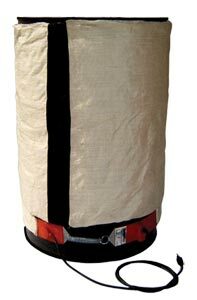 Omegalux® drum heaters can easily be wrapped around a drum and attached with a simple spring and hook arrangement. Once in position, the drum heater provides uniform and even heat to the contents of the drum. Omegalux® drum heaters are manufactured using a nickel alloy resistance wire and fully vulcanized fiberglass reinforced silicone rubber. They are resistant to mechanical damage and to attack from many chemical substances. The use of reinforced silicone rubber material as a base for the drum heater allows the design of extra flexible, very thin and efficient heaters. Each heater band is equipped with a 1.8 m (6') cord set (230 Vac heaters do not have a plug). A built-in metal screen is grounded electrically for safety. All heaters are high potential dielectric tested at 1500V at the factory. Drum heaters are available with either a 115 or 230V rating. When used with lightweight insulating blankets, drum heaters provide more efficient, more uniform heating with better temperature control. Designed for use with 55 gallon steel drums, the rugged aluminized cloth has 1" of fiberglass insulation-for less heat loss and increased worker safety. Provides outstanding freeze protection, as well as temperature and viscosity control. Velcro fasteners make installation easy for a single person. Components are UL recognized and CSA certified.